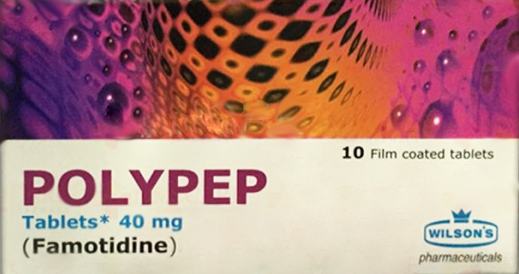 Polypep is produced by Wilson, which contains famotidine and it is best acid reflux medicine . It is being used for the relief of heartburn, acid reflux, indigestion, sour stomach and prevention of those symptoms brought on by taking food and beverages. It actually prevents gastroesophageal reflux disease (GERD) and ulcers in the stomach. Precautions: Tell your physician if you have lever and kidney disease before. And also call your doctor if you have any of these site effects, such as bleeding gums, blood in urine, diarrhea and fever.